With the St Tropez Self Tan Express Advanced Bronzing Mousse (200ml), it’s you who’s in control of your tan by choosing when to shower! This advanced, fast-acting self tan is streak-free and glides easily onto the skin to create a healthy, natural-looking tan. Leave it on for 1 hour for a sun-kissed effect, 2 hours for a golden glow, or 3 hours for a deep, dark bronze colour. Choose your depth of tan, take a shower and witness how the tan continues to develop for up to 8 hours. Enriched with 100% natural tanning agent and vegetan premium that matches your pigmentation, the bronzer has a rich and smooth texture that’s perfectly suitable for all skin types. 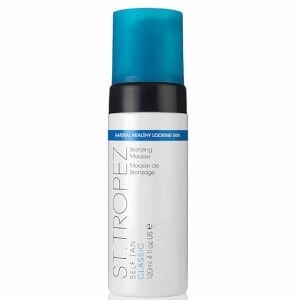 For best results, exfoliate 24 hours before tanning and moisturise to prolong your tan. - N.P. Carry out a patch test 24 hours before use. Don’t apply to broken, irritated or sensitive skin. Stop using if your skin becomes irritated. Wash hands after use. Self tan may stain. Do not get in eyes if you do rinse well with water. Avoid contact with lips.